I've often dreamed of earning a good income without having to work for someone else. I think many moms have the same dream. I have kicked around so many ideas from a bakery, coffeehouse, bookstore, to mine and Dan's dream of owning a BBQ joint. I would love to see one of these dreams become a reality. At the moment, the closest I will be getting to being an entrepreneur is Ramblings. I love hearing success stories of women who have obtained their dream of owning their own business. It helps to hang on to the dream and think that I might be able to do it to. I recently was given the chance to review The Entrepreneurial Mom by Mary E. Davis and I found it quite inspiring. 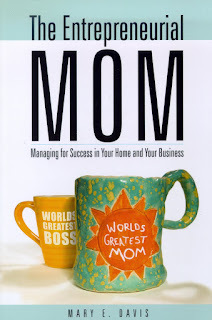 I consider this a must read for mom entrepreneurs. She covers how to handle work and home responsibilities, stress, how to take care of yourself, and so much more. I have enough trouble balancing life as a wife, mother, and blogger; I cannot imagine trying to juggle own my own business, handling employees, and all the other responsibilities owning a business brings. I found that much of the book was just as useful to me as it is for the mom business owner. Her advice is sound, her writing style extremely likable, and the book is full of great information. I urge you to check it out. As for me, I am trying to apply much of the information to my life here at home, organizing my family time, household responsibilities, and blog work. It is going quite well so far. And, I am still holding on to the dream of being an entrepreneur. Someday.